The Tây Sơn Rebellion covers a major civil war in Vietnam, 1770 to 1802. Vietnam had been divided into north and south for 150 years, the Trinh dynasty in the north, the Nguyen in the South. Both governments were corrupt, and their people suffered, especially under the Nguyen. Click more info to see all Amazon purchasing options by country. 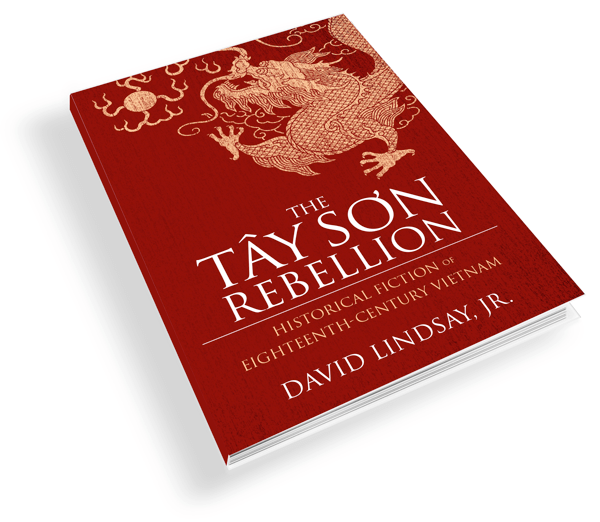 The Tây Sơn Rebellion covers a major civil war in Vietnam from 1770 to 1802. Vietnam had been divided into north and south for 150 years, the Trinh dynasty in the north, the Nguyen in the South. Both governments were corrupt, and their people suffered, especially under the Nguyen. The three Ho brothers, their sister and their parents live near the center of Vietnam in Tay Son. The local mandarin seeks the daughter, Jade River, as an extra wife, but the father turns him down. Physician Ho has already agreed to let his daughter marry a neighbor’s son named Luong Hoang. The Ho family are upset when the father is arrested on trumped up charges by the corrupt mandarin. In order to free the father from jail, they sell the beloved daughter Jade River into marriage for cash. The money is paid to the Mandarin and Physician Ho comes home, . . .
. . . Benoit Grannier is developing his fighting skills in France, and in the American War of Independence, where the French Navy plays a decisive role. The Bishop Pierre Pigneau has a mission in Hatien, Vietnam. He and his elderly assistant are arrested by the local Nguyen Mandarin. In prison they meet an educated scholar who has lost favor, and learn about Vietnam. The scholar explains the complex nature of the two dynasties ruling one country. . . .
David Lindsay, Jr. is a writer, blogger, accountant, and folk music and dance leader and caller living in Hamden, Connecticut. He conceived of The Tây Sơn Rebellion after studying American-East Asian Relations at Yale where he earned a BA degree in history in the spring of 1976, with a thesis titled The Cold War and The American War in Vietnam. He graduated a year after the American War in Vietnam ended.